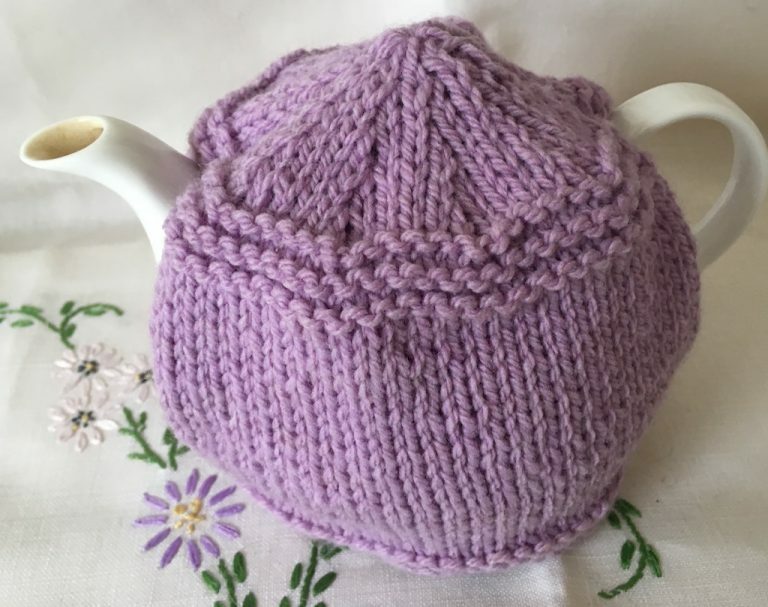 This little tea cosy is simple and quick to knit. 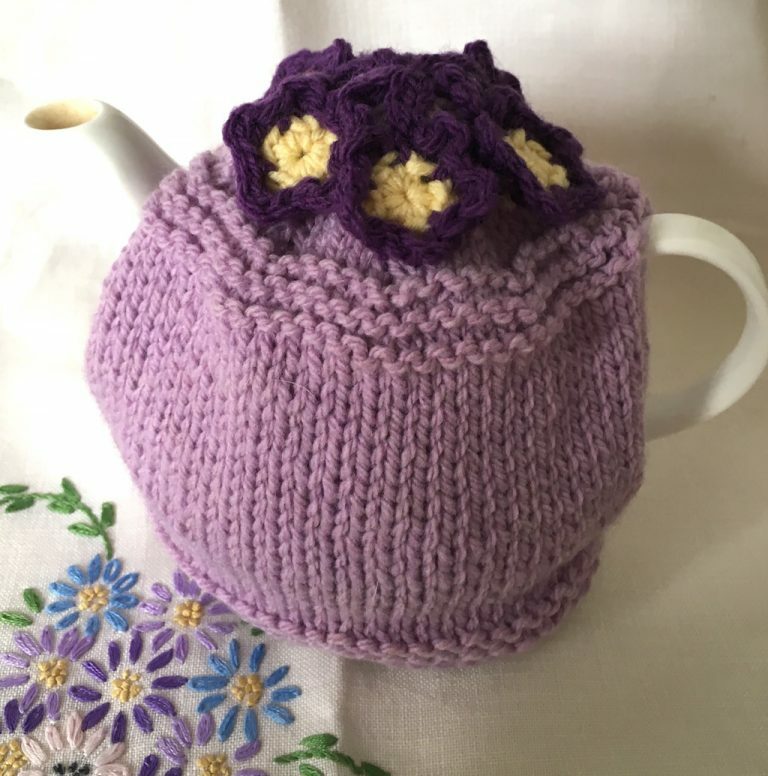 You can make it in a single colour, as I have here, or vary the colours, as I did with the tea cosies I made for Edith’s House cafe, which I wrote about in my blog here. Then just add flowers. Work 4 rows in garter stitch. Next row: k32, cast off 2sts, k to end. On these 32 stitches, work in st st for 19 rows, then break off yarn and slip these sts onto a stitch holder. WIth wrong side facing rejoin wool to other 32sts and work 19 rows st st.
Next row: k32, cast on 2sts using thumb method, k32 from stitch holder. On these 66sts work 6 rows in garter st.
Next row: k2, k2tog (k 4, k2ktog) to last 2sts, k2 (55sts). Next row: k2, k2tog k3, k2tog) to last st, k1 (44sts). Next row: k1, k2tog (k2, k2tog) to last st, k1 (33sts). Next row: (K1, K2tog) to end (22st). Next row: k2 tog to end (11sts). Next row: k2tog to last stitch, k1 (6sts). Break off wool and run through sts, gather up and secure. Join seam, from top to end of garter st band, leaving the rest open for handle. 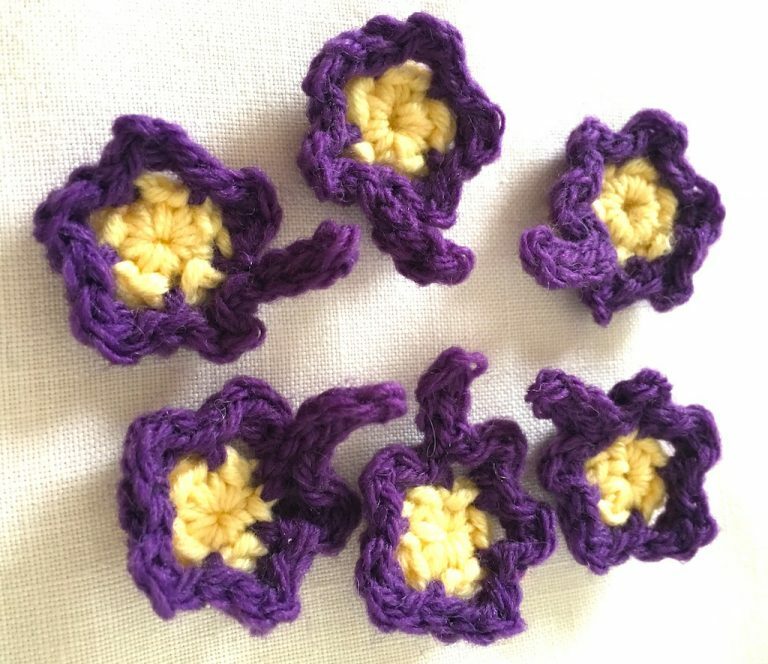 Work a number of crochet flowers in a contrasting colour and attach to top, or on body of cosy as desired. Here, I’ve used lemon DK to make 8dc in a magic ring. Then in purple I’ve made 3 chain, missed a stitch, slip stitched to the next stitch, then 3 more chain, etc. For the final round in each chain space I’ve made a slip stitch, 2 chain and a slip stitch. At the end, I’ve made 4 chain and then, missing the chain nearest the hook, slip stitched back down 3 chain and fastened off. I’ve secured them at the centre of the cosy, down the stem, and at the bottom of the bottom petals. This pattern is © Picking Up Stitches 2017 and is for personal use only. 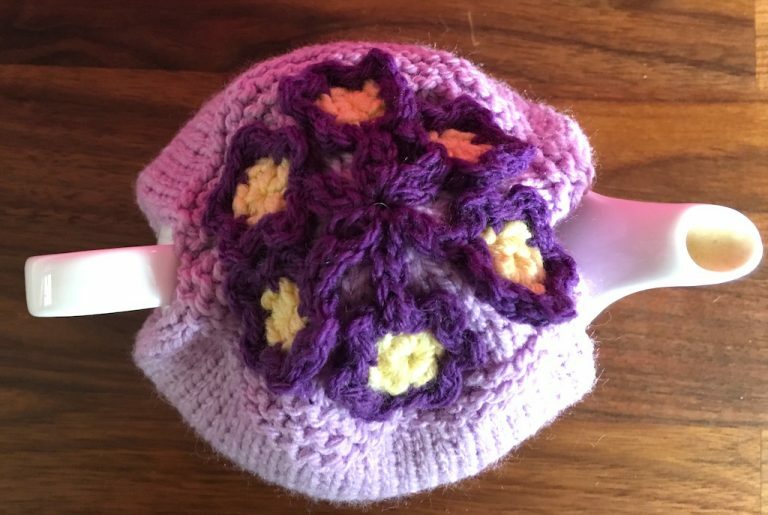 The pattern may not be published elsewhere or offered for sale and the finished items may not be sold.